While every look is different, it’s important to understand the basic areas for applying shadows and liners on the eye. In the near future, Habibi Halaqa’s will have more ‘how to’s’ on how to apply different eye shadow looks. These will range from basic, every day looks to more complex evening or wedding looks. Let’s take the time now to establish a map of the eye before we navigate this new land! The part of the eye that blinks and is below the crease of the eyelid. This is the area of the eyelid that begins at the water duct and ends inline with the inside of your iris. Typically this is a lighter color. This area is directly above the iris and pupil. Usually this is a medium tone, a few shades darker than the inner lid. This is usually begins on the outside of the iris and continues to the end of the lid (outer eye corner). Most often this is a darker color than the rest of the lid. This is where the eye naturally folds. It is usually a darker colour and sometimes matches the outer eyelid colour, or is a shade or two darker. 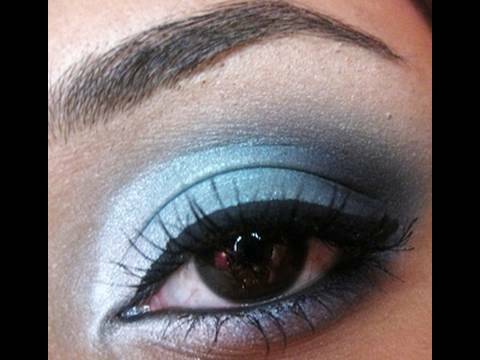 The crease color can be blended upwards, or can be concentrated within the crease. A hard line here that hasn’t been blended – it looks like it divides the eyelid from the rest of the eye is called a ‘crease cut’. The brow bone begins just above the crease and extends just over the rounded part of the bone. Touch it and feel. Once the bone flattens out, stop applying colour. This color is either an extension of the crease color but very well blended out, or a shade similar to what is on the middle lid. Usually a very light color – often a shade of white. It is just supposed to highlight the area. Area around the tear duct. Often the same shade as the inner lid or as the highlight. This area is directly on and a little below the lower lashes. 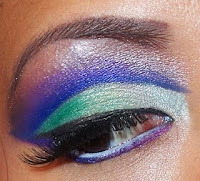 Many people use color this area white for a fresh look, charcoal for a smokey look, or it can be a direct reflection of the colors on the eye lid (purple with light purple, green with light green and pink with light pink). Eyeliner is put directly on the waterline. Again, add white for a fresh look, black for a smokey look, or a splash of colour for a bold look. Remember, all of the colors should be well blended out so as to seem that they melt into one another. Look at the picture below, can you identify the areas and colors? I loved it too! The details were awesome ma sha allah! Oh wow I need to study this! I agree, very 'scientific', which means I love it!